“As Americans, we cannot allow this to continue,” Trump said at the White House in an announcement accompanied by first lady Melania Trump and surrounded by citizens affected by the crisis. “It is time to liberate our communities from this scourge of drug addiction. “It’s never been this way. “We can be the generation that ends the opioid epidemic,” Trump said. “We can do it. Effective today, my administration officially declared the #OpioidCrisis a NATIONAL PUBLIC HEALTH EMERGENCY under federal law. President Trump’s declaration, via the Department of Health and Human Services (HHS), comes under the Public Health Service Act. It lasts for 90 days and can be renewed. The move does not come with specific funding, though Trump administration officials have said it allows such changes as expanded access to medical services in rural areas. The Public Health Emergency Fund currently contains $57,000, and Trump administration officials said they would urge Congress to add more dollars to the fund during budget negotiations. Drug overdoses of all kinds kill an estimated 142 Americans every day, and President Trump said 64,000 died from opioids last year alone. President Trump’s strategy developed from a commission he created after taking office in January. The group, headed New Jersey Gov. Chris Christie, is expected to release its report next week. President Trump said he will be discussing the fentanyl issue with Chinese President Xi Jinping during his trip to Asia next month. He said the Justice Department (DOJ) has indicted several large Chinese drug traffickers, and “they have really put very, very strong clamps on them. 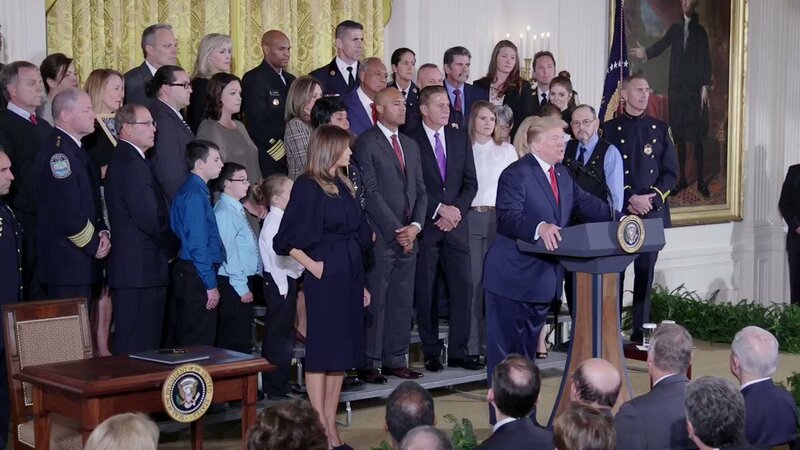 “The Justice Department is aggressively, and really valiantly, pursuing those who illegally prescribe and traffic in opioids both in our communities and on the Internet,” President Trump said. “We will be bringing some very major lawsuits against people and against companies that have hurting our people,” he said. President Trump said his administration will spend “billions and billions of dollars” to develop non-addictive solutions to the opioid crisis. In his remarks, President Trump also spoke personally about his own family’s experience with addiction: His older brother, Fred Jr., died after struggling with alcoholism. “He would tell me don’t drink,” President Trump said. “He would also add don’t smoke. “And to this day, I’ve never had a drink. I have no longing for it. I have no interest in it. “To this day, I’ve never had a cigarette,” the President said. “No part of our society, not young or old, rich or poor, urban or rural, has been spared this plague of drug addiction and this horrible, horrible situation that’s taking place with opioids,” he said. More broadly, the President called said his plan was part of his larger strategy to “confront the drug-addiction crisis in America and confront it head on. “We are going to do it,” Trump said. “For too long, we have allowed drugs to ravage American homes, cities, and towns. “We owe it to our children and to our country to do everything in our power to address this national shame and this human tragedy.